The Port Townsend Marine Science Center invites you to help us raise $15,000 for our mission and programs through GiveBIG, a one-day, online charitable giving event hosted by the Seattle Foundation. GiveBIG takes place on Tuesday, May 3 this year. Our theme is Go Blue! Together we can make an impact! This year, you can schedule your gift in advance. Thanks to a challenge match from a group of local donors, your donation will be matched dollar-for-dollar before being stretched even further by the Seattle Foundation! Your gift allows us to train volunteers and inspire visitors to make a collective impact with our Gone Green? Go Blue! exhibits, continue to monitor the health of local sea star populations, and teach students and visitors how to "be a toxic-free zone." 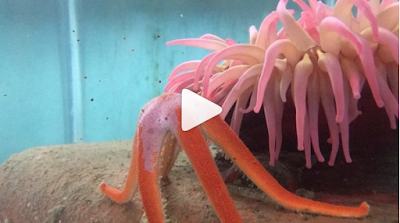 an exciting end to our opening weekend of the Marine Exhibit. 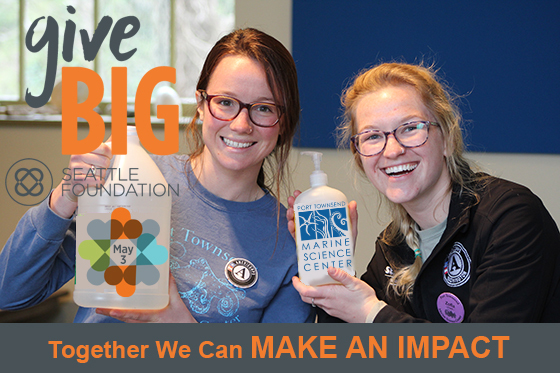 All funds raised during the GiveBIG campaign directly support the Port Townsend Marine Science Center. Thank you for being a champion of ocean health and conservation. The GiveBIG campaign only lasts for one day, so please help us in raising $15,000 on Tuesday, May 3. Want to Go Blue right now? 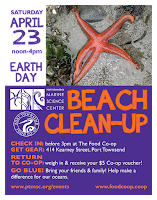 Get a jumpstart on your collective action by joining PTMSC and the Port Townsend Food Co-Op for a community beach clean up, this Saturday, April 23! Learn more and get a $5 food voucher for the co-op.